It’s ironic how having fat and fullness on the body and a lack of volume of the face both contribute to an aged appearance. Facial fat and volume are what allow us to retain a youthful complexion. This fullness is often centered around the cheeks, eyes, mouth, and lips. Unfortunately, as we age, we lose volume in these areas in much the same way as we lose elasticity in our skin. And when this volume disappears, you may be left with a thinned, aged, and tired appearance. When this happens, many individuals start to consider cosmetic surgery. While surgery is a wonderful option for restoring facial youthfulness, the severity and permanent nature of it isn’t for everyone. For patients looking for less invasive and more subtle facial improvements, injectable fillers may be the solution to restoring facial volume for natural-looking results. Having a little extra cushion on the cheeks is a feature often attributed to adorable children. While not many adults desire the full-on chubby cheeks that children have, midface volume is still a desirable feature. Sadly, the midface can be one of the first areas to lose facial volume. When your cheeks begin to hollow or sink, you may feel as though the entire shape of your face is changing. However, JUVÉDERM VOLUMA® XC is available to combat the loss of volume to your cheeks. JUVÉDERM VOLUMA® XC is a hyaluronic acid filler that instantly restores volume and fullness to the midface. This injectable provides the look of lifted cheekbones and a youthful suppleness to the cheeks. The area between the nose and mouth is another region that tends to lose facial volume, and in doing so, deep folds tend to form. These nasolabial folds contribute to a tired and aged appearance. Fillers such as RADIESSE® or Restylane® provide instant fullness to the deep lines and creases that develop due to volume loss. For patients who don’t want a synthetic filler, Sculptra® Aesthetic is an option that restores lost volume around the mouth as well as the hollows all over the face. This injectable is made up of poly-L-lactic acid; instead of “filling” the area, Sculptra® Aesthetic works by stimulating the production of collagen, which allows the skin and hollows to improve themselves. Full, luscious lips are a symbol of youth. Unfortunately, some individuals are born with naturally small lips, and others find that the size and fullness of their lips shrink with age, sometimes almost disappearing altogether. For patients looking to revamp the volume and shape of their lips, Restylane® is the injectable filler for you. You can once again enjoy a natural-looking, full pout that will keep you smiling. 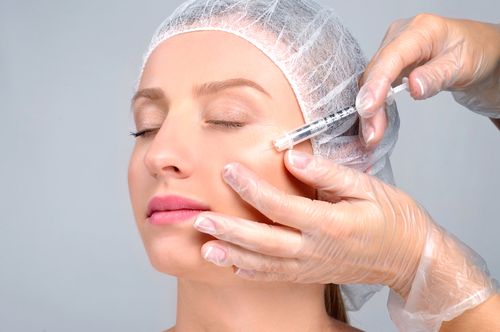 To learn more about how these injectables can restore facial volume loss, contact PREMIERE Center for Cosmetic Surgery by calling (813) 413-7717 to set up a consultation.